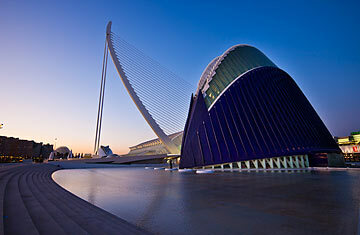 The City of Arts and Sciences rises from the edge of Valencia's center like a modern-day Xanadu. Designed largely by native son and internationally renowned architect Santiago Calatrava, its marvelous collection of spiny, bleached white buildings has been a major tourist attraction in this Spanish port city ever since it was inaugurated in 1998. But more recently, the complex has lost some of its luster. Thanks to the crisis and, more recently, to an opposition party's campaign against Calatrava and the regional government that contracted him, the gleaming City of Arts and Sciences has become a symbol of the excess of Spain's go-go years. And it's hardly the only one of its kind. From cultural centers to transportation hubs to sporting arenas, large-scale urban projects like the City of Arts and Sciences were some of the showiest results of Spain's boom. As the economy prospered in the late 1990s and early 2000s and E.U. money flowed into the country's coffers, municipal and regional governments invested in flashy projects designed to draw attention and  it was hoped  tourist dollars to cities far from the hubs of Madrid and Barcelona. The origins of the craze for lavish provincial construction lie with the Guggenheim. When the New York Citybased contemporary-art museum opened a branch in Bilbao in 1997, it transformed a decaying, postindustrial city into an artistic epicenter  and one of the major tourist destinations in Spain. It hardly mattered that the museum's own collection was minimal; Frank Gehry's breathtaking, titanium-clad building, beached like fantastical treasure ship on the banks of the Nerua River, drew 1.4 million tourists in its first year, a full million more than expected. It wasn't long before other cities wanted to cash in on this so-called Bilbao effect. "For a lot of places, it seemed like a simple formula," says Llàtzer Moix, author of Arquitectura Milagrosa, a book that investigates Spain's infatuation with large-scale urban design. "Plan a cultural center. Get a star architect to build it. And voilà." Ignacio Blanco, spokesperson of the opposition Esquerra Unida (United Left) and a member of Valencia's regional parliament, well remembers the enthusiasm of his colleagues across the aisles for the City of Arts and Sciences when it was originally proposed. "Instead of worrying about education and health care, they wanted the glamour," he recalls. "They said it would put Valencia on the map." To an extent, the formula worked. In 2011, regional president Francisco Camps announced that the complex had brought in some 40 million tourists since it opened, and the complex has indeed become the most readily identifiable sign of the city. But visibility alone does not mean success, especially in times of economic crisis. The Valencia project came in four times over its original budget, and its final unit was not completed until 2005. And it's hardly alone. The Oscar Niemeyer International Cultural Center, a massive exhibition and performance space designed by the Brasilian architect for the northern Spanish port city of Avilés, ceased programming less than a year after it was inaugurated in March 2011. After decades of planning, Santiago de Compostela in northwestern Spain finally inaugurated its City of Culture, a Peter Eisenman campus, containing a museum, a library and a performance space, in January 2011. Yet the eventual $500 million spent wasn't even enough to finish the complex: the city ran out of money before completing two of the six planned buildings. "The crisis hit, and they didn't have any choice," says Anxo Lugilde, Galicia correspondent for La Vanguardia newspaper. "They had to stop construction." Nor is it merely cultural projects that have felt the pinch. During the boom years, Spain massively expanded its transportation network, building new high-speed rail lines and opening airports in provincial capitals in the hopes of attracting low-cost carriers like Ryanair and easyJet. Whether this new infrastructure was needed seemed almost beyond the point; cities like Lleida, located just two hours' drive from Barcelona, or Ciudad Real, two hours south of Madrid, invested millions of dollars in building their own. "In the Western world today, war isn't military, it's economic," says Moix. "So during the boom you had a competition between cities to see who could capture the most weekend tourists. Whether it was sensible for every provincial capital to have its own museum or its own airport didn't really factor into the equation." Indeed, since the start of 2012 two such airports  Castellón's in the region of Valencia and Ciudad Real's in CastillaLa Mancha  have seen all their commercial flights canceled. Both airports now stand empty. But in a year in which the Spanish economy is expected to contract 1.7%, bailout pressures are growing ever stronger, and each week seems to bring word of a new cutback, that a herd of white elephants are no longer going unremarked, especially in Valencia. Late in April, Esquerra Unida announced that, after years of trying to gain access to the region's accounts, its representative Blanco had finally seen the government's bills for the City of Arts and Sciences. The first week of May, it launched a website exposing those costs. Translated loosely as "Calatrava Bleeds You Dry," Calatravatelaclava.com site alleges that Valencia paid the famed architect €94 million ($120 million) for the City of Arts and Sciences alone (it also paid him for several other projects), and that he received preferential treatment despite the fact that he charged more than other architects. "He also avoided paying Spanish income and value-added taxes," says Blanco. "Because even though he has an office here that oversaw the construction, he billed from his office in Zurich." In a statement released to the press, Calatrava did not refute the amount of his billing, but noted that his accounts had been carefully audited, and that they were "from the first contract, correctly adjusted to the quality and volume of the work." In an interview with TIME, his lawyer Francisco Vega rejected the charge of impropriety. "Santiago Calatrava left Spain for Switzerland in 1975 for school, and has lived there ever since," Vega says. "He doesn't pay Spanish taxes because he doesn't live in Spain. He pays Swiss ones, which I dare say are higher." Vega is investigating the possibility of bringing charges against Esquerra Unida for defamation. But Blanco says that the architect is not his real target. "We're not against Calatrava. We're against the politicians who allowed this kind of excess." In Valencia's case, that excess still costs an estimated $896,000 a year in maintenance and upkeep  a quantity increasingly difficult for a city that recently had to sell $635 million worth of short-term bonds at rates higher than Greece's. Perhaps that's why Lugilde's words ring true there. The journalist was speaking about Santiago de Compostela's City of Culture, but his words apply to any number of other white elephants in Spain. "People criticize it by saying it was an accident that got out of hand. But in some ways, it's the perfect monument  a monument to the bubble, and to our misuse of funds."